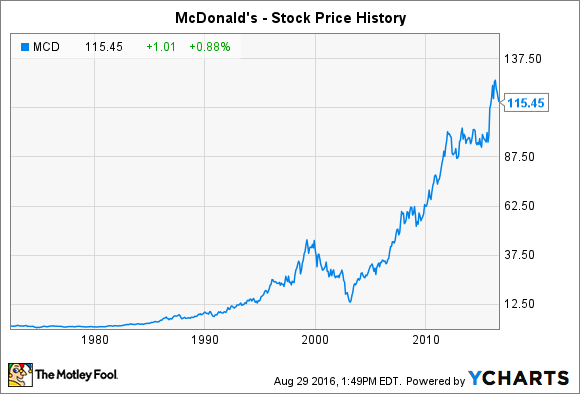 Investing in McDonald's stock has given investors a huge reward over time. McDonald's (NYSE:MCD) is an American icon around the world, but McDonald's stock history is also extremely impressive with a long track record of dividends, stock splits, and other shareholder-friendly moves designed to deliver investor returns. Currently valued with a market capitalization around $95.5 billion, McDonald's recent performance deserves attention as a potential stock to buy. After having faced heightened competition from fast-casual restaurant chains as well as its traditional fast-food rivals, McDonald's is emerging stronger than ever. Let's take a look at how McDonald's stock has outperformed the stock market throughout its historical stock price performance and whether the company can keep climbing higher. As you can see in the chart above, McDonald's has posted strong returns for long-term shareholders. According to the company's website, an initial investment in 100 shares for $2,250 at its IPO in 1965 would have grown into 74,360 shares through stock splits and stock dividends alone. Those shares would have been worth $8.8 million as of the end of last year, and that doesn't even include the impact that reinvesting cash dividends would have had on total performance. Most of McDonald's history has involved steady periods of growth. From the 1970s through the late 1990s, McDonald's shares soared almost without interruption. For more than a decade now, McDonald's has continued to climb. Yet the biggest threat to McDonald's came during the end of the tech boom from 2000 to 2003. The fast-food giant lost more than half of its value, due largely to the fact that the company experienced several years of falling revenue. McDonald's even suffered its first loss ever, and investors had to get used to the idea that the company wouldn't be able to generate earnings growth of 10% to 15% annually on a consistent basis going forward. In particular, changing tastes among restaurant-goers threatened to leave McDonald's behind. The response that McDonald's made has been exceptional. The company branched out with new offerings geared toward healthier thinking, and the effect was to go against the popular mindset that McDonald's was a place for smart restaurant patrons to avoid. Revamping its menu offerings was just one element of the comeback, as McDonald's also renovated some of its restaurants to create a more attractive environment for a new generation of customers. That helped inspire a turnaround. Since then, McDonald's has made even bolder steps. The introduction of the McCafe line of hot beverages helped fight back against premium coffeehouses, and the recent move to make some of its most popular breakfast items available all day has paid off in higher sales. The fight is far from over, but favorable movements in the commodities markets have reduced food inflation rates and helped McDonald's contain costs, and that has added to the more favorable profit outlook. Where will McDonald's go from here? Going forward, many investors are enthusiastic about McDonald's prospects. The company has already done a good job of penetrating the global market, with an influence across most of the world. Yet in some emerging markets, McDonald's is far from having reached a saturation point. Moreover, having found success even through difficult economic climates across much of the globe, McDonald's stands to gain even more once the economic turnaround puts more money in consumers' pockets that they can spend on discretionary purchases like eating out. McDonald's stock has had a long and illustrious history, and shareholders who've stayed the course through good times and bad have been amply rewarded. The restaurant industry will continue to feature fierce competition and require constant innovation in order to keep up, but McDonald's has demonstrated its ability to come up with new concepts that respond well to changing times. With its unparalleled brand awareness, McDonald's has the potential to keep delivering for shareholders far into the future.